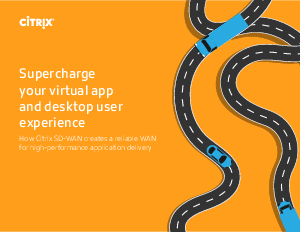 Explore the benefits of combining Citrix SD-WAN and Citrix Virtual Apps and Desktops to deliver apps to every user, everywhere. Software-defined WAN (SD-WAN) technology makes it possible to deliver a great user experience, regardless of how great your connection is. Citrix SD-WAN delivers an integrated solution that optimizes the value of Citrix Virtual Apps and Desktops virtual app and desktop delivery. This integrated solution lets you: provide more bandwidth over available connections, optimize performance for real-time network conditions, and ensure always-on connections with a quality experience.